I have mentioned this before, and since we are still fairly embedded in soup season in the Midwest, I love French onion soup. I’m not sure I am the biggest fan of using a mandolin to slice lots and lots of onions, but the simple, slow caramelizing of those onions really brings joy to every bite of the soup. My wife often discuss the fact that we really love eating the once crusty and cheesy crostini that we float on top of the onion saturated broth, however we always say that we would never really enjoy that texture anywhere else. I mean, what else is there that has that texture that you know of? Bread pudding? Not sure. 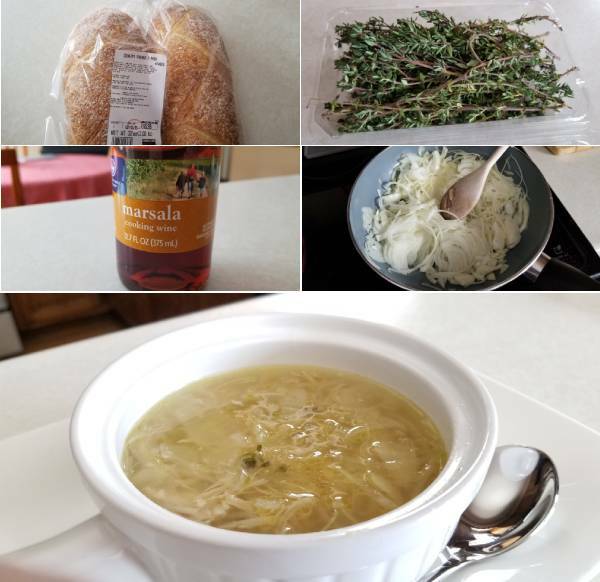 So as I was deciding what to make the other day, I knew I had some ckicken stock that I batched out the day before, and decided that I would take some of the basic concepts of what I do for the French Onion Soup, but twist it up ever so slightly and go with a Chicken French Onion Soup. Was it worth it? You betcha! Start by heating a skillet on medium heat, large enough to hold the onions, and add in the butter. Let the butter melt, then toss in the onions. Give them a good stir, reduce the heat to a medium-low, and continue to cook. Stir every few minutes or so and watch the temperature. You want these to go low and slow for the most part. This should take about 25 minutes or so, maybe longer. Be patient and enjoy the sounds and more importantly the smell. Once the onions have softened to your liking, add in the stock. Give it a good stir, then add in the thyme, marsala wine, and shredded chicken. Stir again, and bring up the temperature to a medium heat. Cover and let cook for 30 minutes. Season with salt. Go with about a teaspoon, stir and wait a few minutes. Taste, and add more salt if you desire. This one needs a bit of salt. When you are about to serve, take your bread and lightly toast it under the broiler. Once the bread begins to crisp, remove, add the cheese to the tops, and return to melt the cheese. Ladle the soup into your bowl, and top with a big cheesy crostini. Dig in. Was this soup great? Yes, yes it was. It was a bit sweet, but that was A OK. This was a great use of chicken stock, and was a nice pathway to a pleasant family meal. 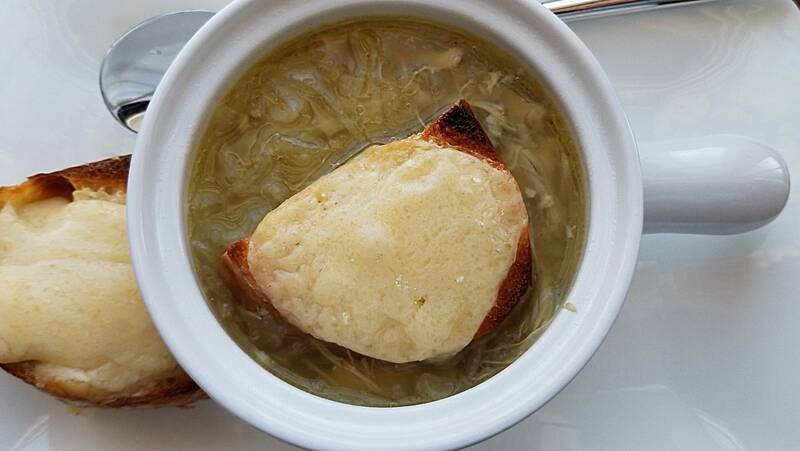 Are you a chicken, beef, or straight up onion when it comes to French Onion soup? Me? I will make and eat any of the three! An easy soup that uses lots of onions, shredded chicken, and fresh thyme.